The Facebook pixel is an analytics tool that helps you measure the effectiveness of your Facebook advertising. Add the Facebook pixel to your Pixpa store to track ad conversions, improve audience targeting and maximise your return on advertising spend. Before you add a Facebook pixel to your store, we recommend you to learn more about the Facebook pixel at the Facebook Help Center. You need to setup your pixel first in Facebook Ad Manager. Click here to see how to get the pixel code. 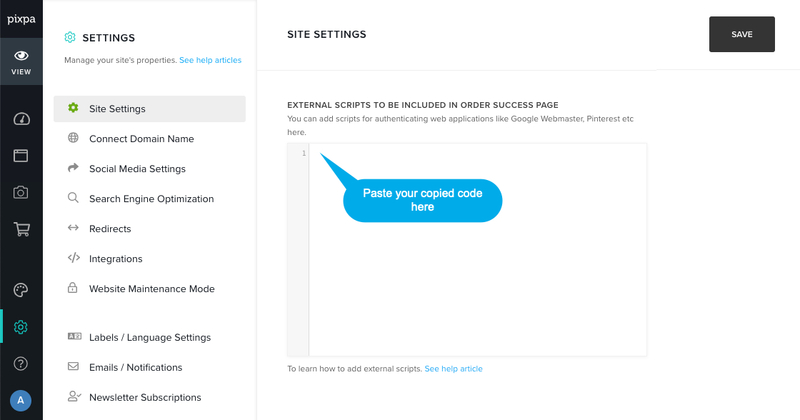 Install the pixel code to your store and website so that it loads on each pages. Facebook pixel code can be added above or below existing tracking tags (such as Google Analytics) in your site header. Copy the entire pixel code and paste in the <head> external script section. Click here to know more. Standard events within the Facebook pixel code enable you to track specific events, optimise for conversions and build audiences. Standard event codes are case sensitive, so make sure that you copy the code snippet exactly as it appears. For example, the standard event code for tracking page views is fbq(‘track’, ‘PageView’); as shown in the table below. Click here to know more. The default value and currency in the standard event (purchase) code is USD 0.00, but you can edit this to reflect the true value of your conversions. If you have multiple values that you want to track (e.g. you’re selling multiple items with different prices), you can make the value dynamic. You need to add this dynamic event snippet in order success page. Click here to know more.